Kythnos is part of Cyclades and it is one of the northern islands of that complex. It is located between Tzia and Serifos islands, while it is also known as Thermia, due to the hot springs found in Loutra village, the only one of their kind in Cyclades. Kythnos is an island with significant advantages, as it has countless beautiful beaches, a scenic capital and it is only a short distance from Athens, through Piraeus of Lavrio. The famous beach Kolona is a must-see, as it is the most popular attraction, being one of the most unique in Cyclades. Kythnos is a destination for quiet vacations, with little nightlife. 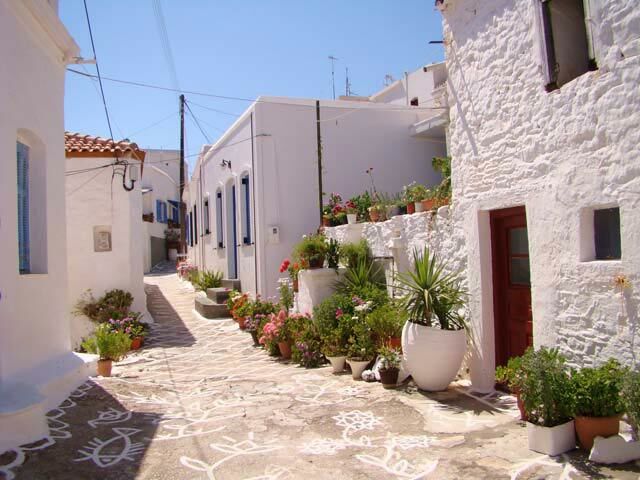 Despite the tourism development the island has preserved its traditional character. In terms of vegitation Kythnos is a typical island of Cyclades, with the resounding exception of Panagia Kanala village where there is a pine forest. If you happen to be on Kythnos in August 15th you are bound to run into the festival organized in Panagia Kanala. Take the chance to visit the temple itself to see the miraculous metabyzantine icon painted by Antonis Skordilis. Kythnos has countless beaches, most of which are not organized. 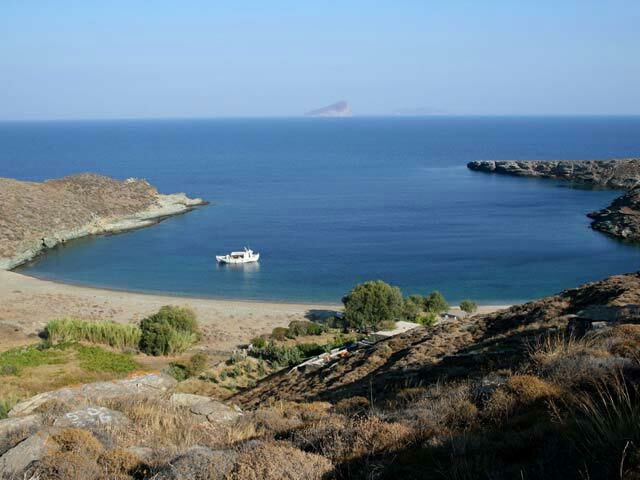 Merihas (West Kythnos): One of the most popular on Kythnos, with easy access, thin golden sand and clean blue sea. Martinakia (West Kythnos): A small beach with sand and a couple of tamarisk clusters. Episkopi (West Kythnos): One of the beaches close to Merihas with nice sand, clean sea and tamarisk trees. Flampouria (West Kythnos): A large beach with sand and pebbles offering turquoise water and some tamarisks. Gaidouromantra (Southeast Kythnos): An amazing large sandy beach that does not get crowded. Megali Ammos (Southeast Kythnos): A large sandy beach under the church of Panagia Kanala. Skylos (Southeast Kythnos): Fantastic quiet beach with white pebbles, and crystal clean water, but difficult access. Agios Dimitrios (South Kythnos): The southern beach of Kythnos with thick sand and easy access. 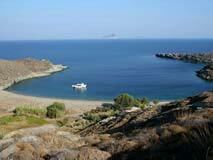 Kolona (Northwest Kythnos): The most impressive beach of Kythnos, a strip of sand surrounded by sea. Fykiada (Northwest Kythnos): A large beach with sand and green turquoise water next to Kolona beach. 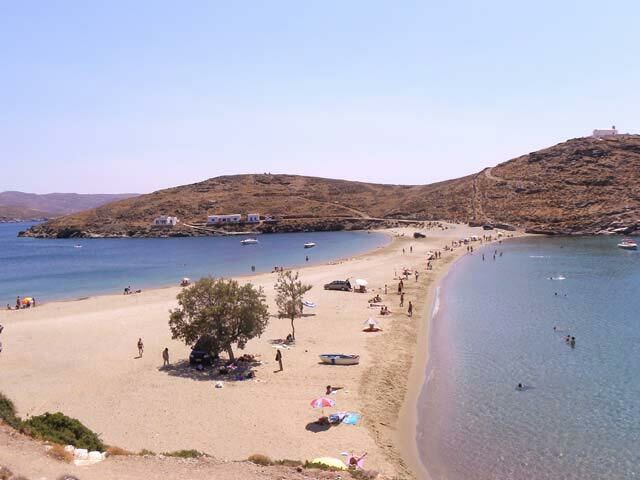 Apokrousi (Northwest Kythnos): One of the largest beaches of Kythnos with nice sand and tamarisk trees. Loutra (Northeast Kythnos): A beach with sand and thin pebble at the upcoming tourist resort of Kythnos. Schinari (Northeast Kythnos): A relatively small sandy beach with several tamarisk trees, some of which reach the sea. Agios Sostis (North Kythnos): The northern beach of Kythnos with calm clean sea and sand with thin pebble. Naousa (East Kythnos): A nice quiet beach with sand in a protected bay. By ship from the port of Piraeus it will take you almost 3 hours to reach Kythnos. You have the alternative of getting a ship from the port of Lavrio, which will take you to the island in 2 hours with a much more frequent schedule and half the price of the ticket from Piraeus. There is public transportation connecting the pain parts of Kythnos (Kanala, Dryopida, Loutra and Chora / Mesaria) but the routes are not really frequent, as the bus passes approximately every two hours, making car a neccessity. If you do not have your own vehicle you can rent a car or a motorcycle on the island, while there are also some taxis going around. The road network of the island is not bad. The basic choices for your stay on Kythnos is Mesaria, Merihas and Loutra. Mesaria is a picturesque and quiet settlement but it is not by the sea, while on the other hand Merihas is more vibrant and right next to the sea, but it pales in comparison to the beauty of Mesaria. Both settlements are close to the center of the island. Loutra is by the sea and it is located at the north side of the island. Kythnos has a remarkable cooking tradition with delicious pies like pitaro (traditional cheese pie) and kolopi (covered spinach pie). Other traditional flavors include savoro (marinated fish), sfouggato cheese (fried local cheese), strapatsada (scrambled eggs) with zucchini and local pork meat. Whatever the meal, make sure you enjoy it with the local kopanisti cheese and a glass of local thermiotiko wine. In Merihas you should visit the Rock Castle for a drink and Veggera for an excellent waffle. On Kythnos you will find local cheese products of high quality like kopanisti and trima, sausages, fantastic local honey, local thermiotiko wine and rusks. For dessert try local pasteli (sesame and honey bar) and the almond-based marzipans which have a long tradition on the island. Finally, there are several shops with hand-made ceramic products. The scenic capital of Kythnos is built ampitheatrically at a hillside. A small collection mostly of ecclesiastical relics of Kythnos from the Byzantine period. The warm water coming out of the two springs of Kythnos Hydrotherapy Center is ideal for a range of diseases. One of the largest unused caves in Greece, resembling a labyrinth, decorated with breath-taking stalactites and stalagmites. Its collection includes items from everyday use and traditional costumes worn by people of Kythnos. Here used to stand the capital of Kythnos, but now lie only ruins of churches and murals, as well as amazing view. Panagia Kanala is the patron of Kythnos and its temple is found in the homonymous settlement. 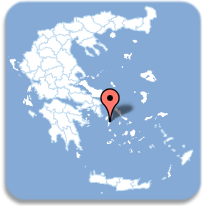 The oldest outdoor settlement in Greece with human skeletons and architectural remains of the Mesolithic Period. 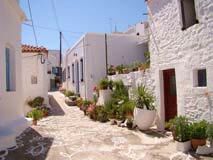 Welcome to the Kythnos page of Greece Vacation Search! Here you will find all the information you will need for your summer vacations on Kythnos. Subscribe to our newsletter in order to receive news, offers and updates regarding the Kythnos and all the other Greek islands.